Skin is the body’s largest organ of elimination, shedding 40,000 cells per minute. Ten minutes of daily dry brushing can help buff away these dead skin cells, remove toxins, boost circulation and lymphatic drainage, improve skin tone and texture, and reduce the appearance of cellulite. Exfoliating wet skin can fold dead cells back into the skin. “While using a scrub in the shower can help exfoliate it doesn’t eliminate pesky dead skin cells as well as a dry brush,” says Heshelow. “Choose a brush with natural bristles that are slightly stiff, but have some movement,” says dermatologist Dr. Joel Schelssinger. Before you start, make sure that your skin is completely dry. Starting at your ankles, brush in circular motions working your way up toward your heart. Don’t brush too hard. 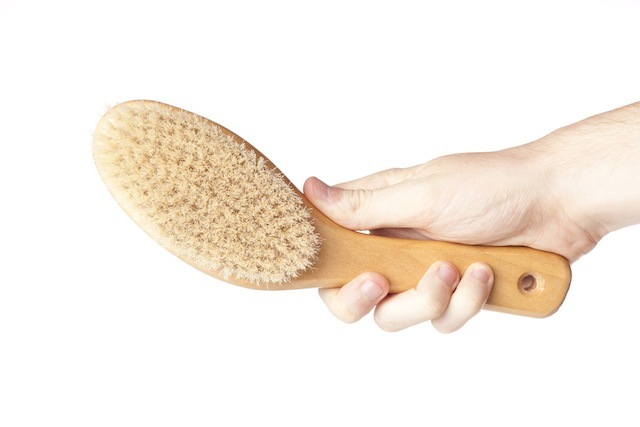 Your skin shouldn’t be red or sensitive to the touch after dry brushing. It’s best to brush right before taking a bath or shower and follow with a body moisturizer. “Your body will benefit most from dry brushing three times a week. If your skin is sensitive, try only brushing once a week. Additionally, avoid any areas that have sunburn, an open wound, a rash or patches of eczema or psoriasis,” says Dr. Schlessinger. Dry brushing is a skincare technique used by spa technicians to scrub and exfoliate the skin. It also stimulates body circulation, rids toxins and any excess water, such as bloating. “It will not only shed dead skin cells and encourage new ones to form; giving your skin a brighter looking appearance, but it will also help eliminate cellulite,” says Paola Berrios is an esthetician at Bellezza Spa, near Washington, DC. “Dry body brushing is the ultimate way to achieve superior skin exfoliation. The benefits of dry brushing are seemingly endless – the simple process banishes bumps and ditches the dimples, increases circulation and lymphatic flow, aids in removal of ingrown hairs and even improves metabolism and the body’s natural detoxification process,” says Greg Moses, General Manager for BioElixia, who is launching their new Body Brush with Pure Cactus Bristle next month. The bristles of the brush stimulate below the surface of the skin to get the blood flowing, says Marissa Vicario, a board-certified heath and nutrition coach. The practice of dry brushing helps you to slow down and bring more intention to your day, just like meditation. It’s relatively inexpensive and it actually works. Vicario points out a skin brush costs anywhere between $7-$10, depending on brand and where you buy. Not too shabby for all those benefits!